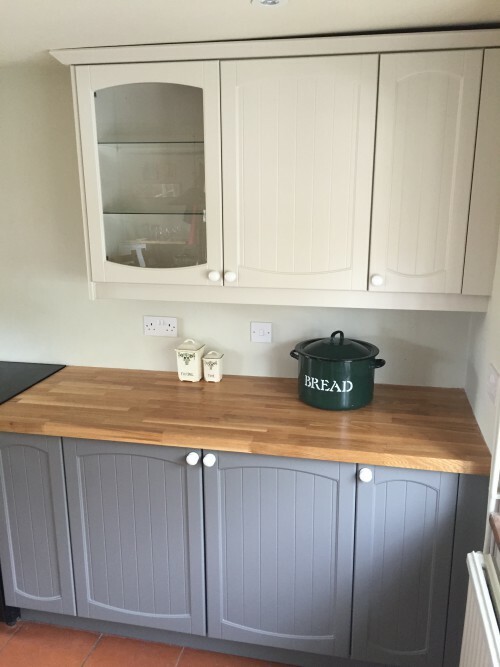 This Traditional Painter, Hand Painted Kitchen project was housed in a beautiful barn conversion in the rolling Herefordshire countryside – the building was converted about 25 years ago, but the building itself was much older, with daub and wattle panels and character beams a plenty! 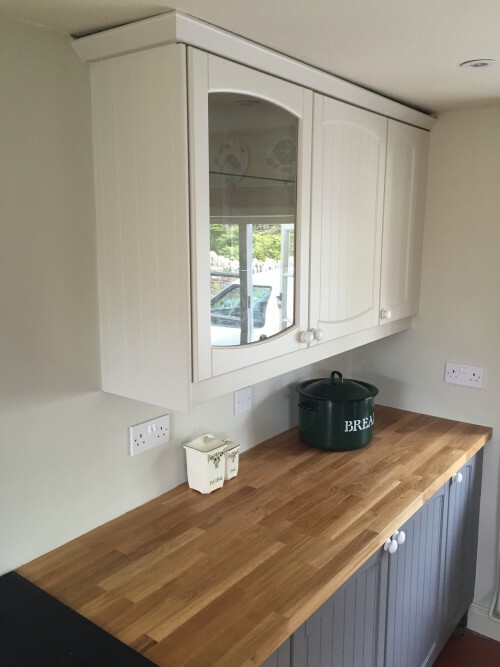 My clients had inherited this kitchen from the previous owners, around 18 months ago, when they moved from Shropshire to enjoy this splendid location. 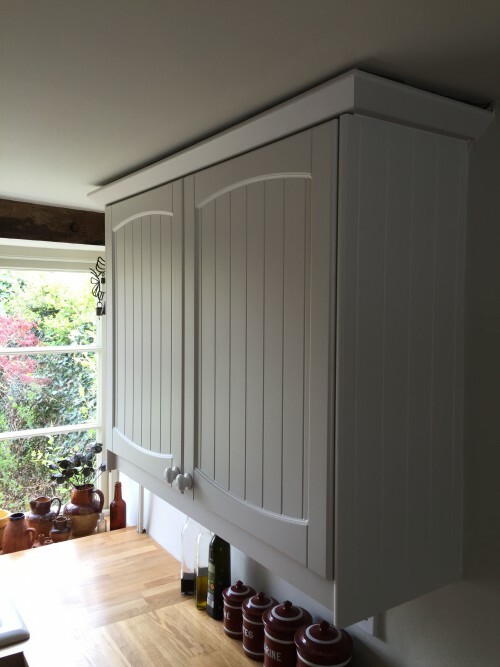 This project is a good example of the variety of types of doors and carcasses that it is possible to Hand Paint, being a foil wrapped example with a very slight texture to the doors and drawer fronts; MDF in construction with a plastic foil heat shrunk around, to form a finish. 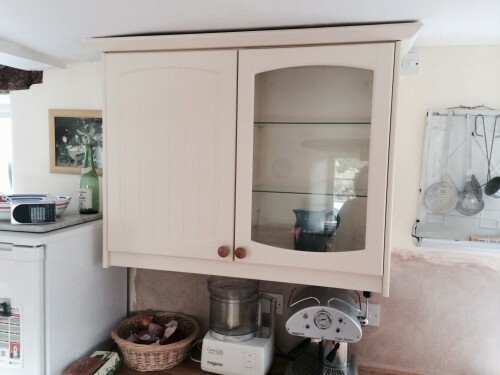 The carcasses were chipboard with a laminate/melamine finish. As is customary, I set about protecting all worktops and floors in my working area with good quality lining paper. I then thoroughly degreased to remove any vestiges of grease, oil or dirt from the surfaces to be painted. 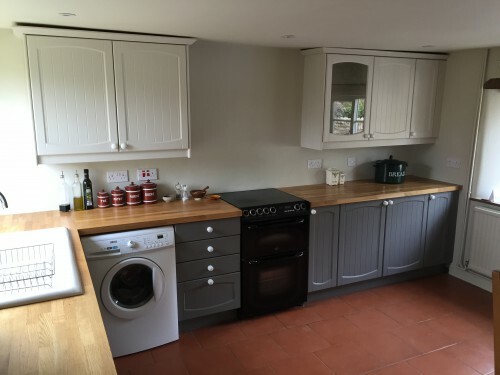 The next stage was to run all over the substrate with my dust-free sanding system (removing 99.9% of dust)… once surfaces had been abraded, base coats were applied; Pegaprim Isofix, expertly tinted to the exact shade that I required by Holman Specialist Paints. It is possible to accurately colour match “any” colour into my preferred (superior, in my opinion) bases. 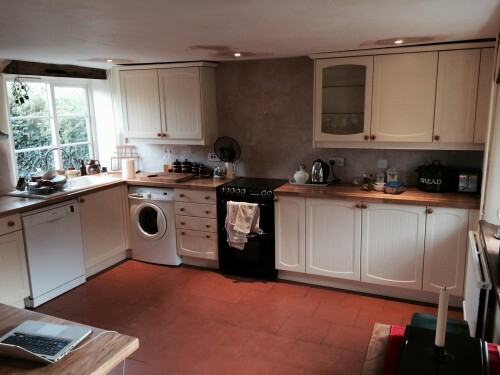 Tops coats of Tikkurila Helmi were then applied to complete the paint application system. 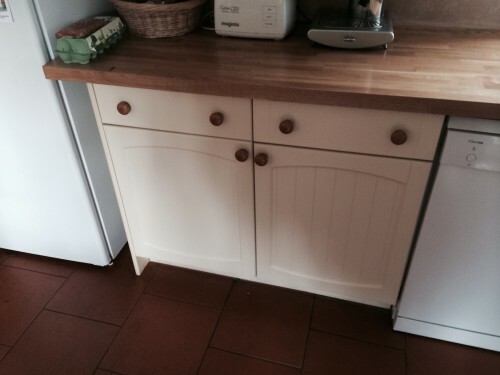 Once new door furniture had been been fitted, the kitchen was ready to hand back to my clients. My clients, during this project, had been staying at their London residence and so saw a massive transformation when they walked back in to see the progress of my work… the comments and thanks that I received was fantastic, I was quite taken aback – I would also like to thank them for my time at their property; such a welcoming and beautiful environment! 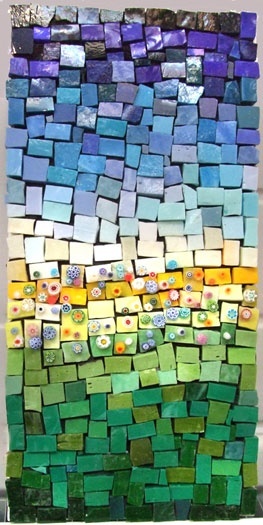 A bespoke mosaic splash back, created by Mandy Farmer, is now being considered, to set off the “new” kitchen in all it’s glory! 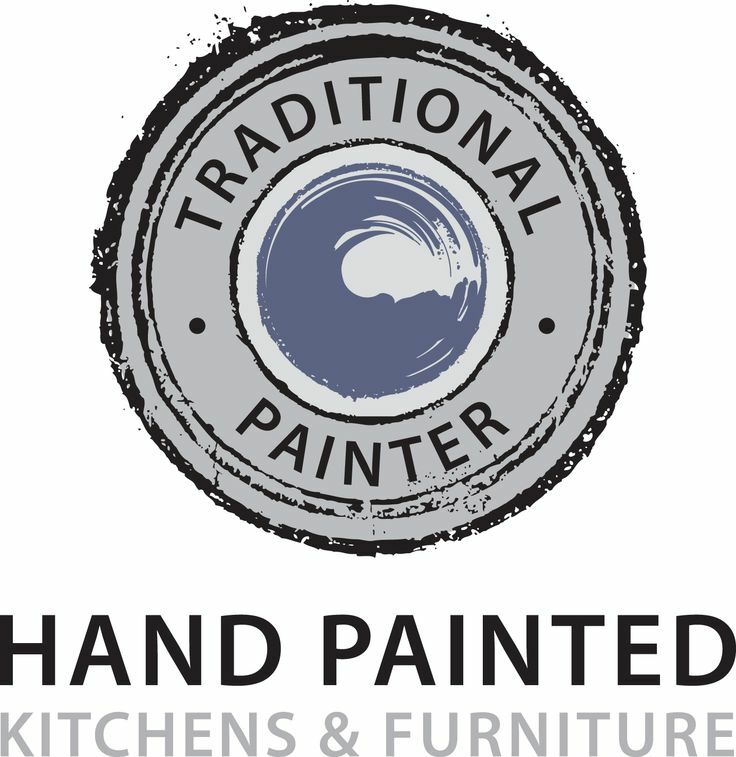 This entry was posted in Uncategorized and tagged Dust-Free Sanding, Festool Dust Free Sanding, Fluxaf Pro Clean, Hand Painted Kitchen, Hand Painted Kitchen project, Hereford, Herefordshire, Holman Specialist Paints, Mandy farmer Artwork, mandyfarmerartworks, Pegaprim Isofix, Tikkurila Helmi, Traditional Painter, West Midlands on May 2, 2015 by mjguestltdblog.